Marrakesh-Safi (Arabic: مراكش آسفي‎) is one of the twelve regions of Morocco. Its population in 2014 was 4,520,569. The capital is Marrakesh. 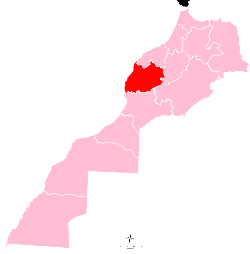 Marrakesh-Safi was formed in September 2015 by merging the old region of Marrakesh-Tensift-El Haouz with the provinces of Safi and Youssoufia in Doukkala-Abda region. ^ a b "Population légale d'après les résultats du RGPH 2014 sur le Bulletin officiel N° 6354" (pdf). Haut-Commissariat au Plan (in Arabic). Retrieved 2015-07-11. ^ a b "Décret fixant le nom des régions" (PDF). Portail National des Collectivités Territoriales (in French). 20 February 2015. Archived from the original (pdf) on 18 May 2015. Retrieved 11 December 2015. This Marrakesh-Safi location article is a stub. You can help Wikipedia by expanding it. This page was last edited on 13 December 2018, at 13:15 (UTC).